This blue dome lid fits on our expanded metal outdoor trash receptacle street basket for a finished look that keeps trash in place. Domed lids are available in other colors. We also carry swing top lids and flat top lids. 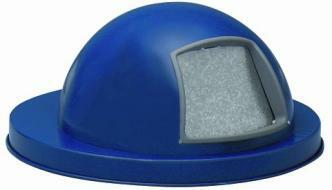 Go to top of this Blue Dome Lid for Expanded Metal Outdoor Trash Receptacle page.